Many people don’t realize just how strict the Maryland gun laws are until they are arrested or until a loved one is arrested for one of these crimes. The Firearms Safety Act generated a great deal of media attention back in 2013 when it was passed, and again recently when it was upheld by a federal judge. The Act made it tougher to be able to purchase a handgun, but more importantly it banned 45 types of weapons from being sold within state lines, and made it illegal to sell high capacity detachable magazines with more than 10 rounds. But even before the Firearms Safety Act went into effect, the state gun laws were some of the strictest in the country. And these laws are considerably stricter than many of the states nearby, which often leads to out of state residents being arrested for something that is completely legal in their home state. Benjamin Herbst understands how devastating a gun charge can be in Maryland, but he also has the experience and dedication to achieve to best possible outcome for each of his clients in these cases. He has represented numerous out of state defendants in gun charges from places such as Virginia, North Carolina, South Carolina, and Florida, and is ready to fight for you or a loved one as well. Handgun in vehicle is one of the most common gun charges for out of state residents. Many of these cases occur as a result of a traffic stop on interstate roads such as I95 or in hotels or hotel parking lots where travelers have stopped while driving through the state. Police officers are aware of the strict state gun laws, and will go to great lengths, even affecting unlawful detentions and conducting illegal searches to find a weapon in a car or on a person they think is carrying. Travelers from states such as North Carolina, South Carolina, West Virginia, and other states with more liberal gun laws are especially at risk, because cops will often assume they are they have a firearm. This is especially the case for the Maryland Transportation Authority police officers and for state troopers who focus on cars with out of state plates. But local cops are also in on these tactics, and many times defendants are caught off guard. 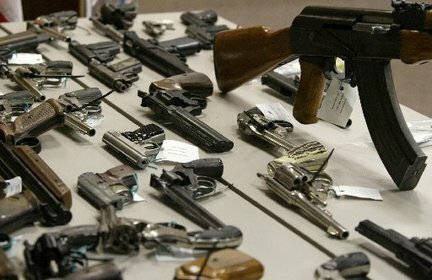 The Herbst Firm handles all types of weapons cases for out of state defendants including transportation and possession of a handgun, and possession of ammunition. Our main goal in every case we take is to assure that our clients avoid having a permanent conviction, and that they do not spend even a single day in jail. We will take all the necessary steps to try to achieve a dismissal, including the filing any pretrial motions pertaining to the search and seizure of the weapon. If a dismissal or a satisfactory plea agreement is not reached, we will not hesitate to take your case in front of a jury. If you have any questions about the strict state gun laws, or if you or a loved one needs effective legal representation feel free to call 410-207-2598 for a free consultation.